We have received reports from some users that the app crashes when viewing temple details. For everyone that we spoke to this was solved when they updated their phone iOS to the latest available through Apple. For iPads this was 7. We have tested this APP over many months on different screens / sizes / Devices and can attest to the fact that it never crashed. Only after release did we encounter this problem of app crashing when going into temple details. The solution is not within the app but in your phone iOS version. This is a 5 Star review one of the users left for us in Australia on the same issue. Excellent app, but Make sure you Update your Phone’s iOS version. I initially bought the app to see temples, this is my first app purchase and I was really angry as it kept crashing when I tried to open any of the temple details. Happened time and again, I was going to leave a 1 star review and ask for a refund. Finally I thought of giving it one last chance and updated my phone iOS version to the latest 7.1.1 and BOOM the problems are all gone, the App works perfectly fine. I can see all the temples details in my area, found some new ones that I didn’t know about, didn;t realise there were so many hindu temples in Australia. Very good app , but just make sure you update your phone iOS to the latest before starting the app else it will keep crashing just as it did for me, Also I prefer the Map view to explore the temples as the list view is limited to 100 Temples. The Worldwide location lets you see all the temples in the world in MAP View. 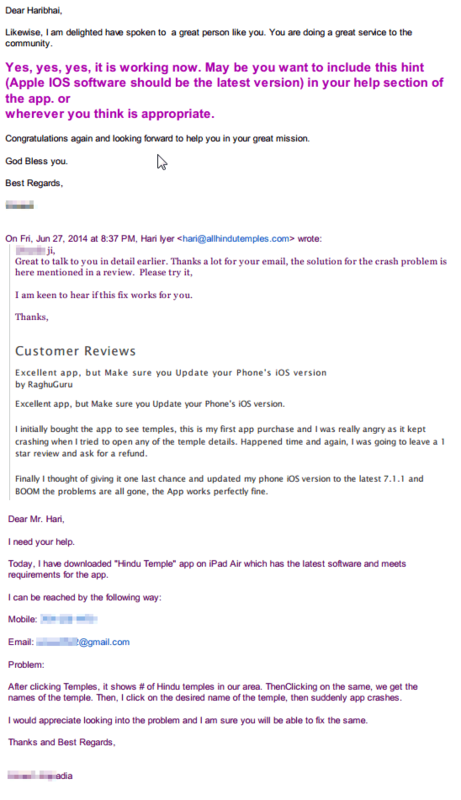 The same solution worked for an iPAD Air when one of the users from the US contacted us about the app crashing. Here’s the conversation I had with him. In Summary Updating the iOS version to the latest one helped him fix the problem of app crashing. In Summary it is not a problem with the app, just with some non updated OS versions. Unfortunately Apple prevents developers from updating the metadata of the App without an update so there is no way I can add this info in the listing on iTunes until the next update.